Easter has come and gone and I bet you’re left with a lingering Easter candy. Jason and I don’t have kids but we do make each other Easter baskets each year. We have a lot of fun with it and like to get creative. One year Jason bought a purse that I had my eye on and stuffed it with candy. Last year, I made Jason a frame piece of art out of buttons and filled his basket with themed items that matched the art piece. So, what do you do with leftover Easter candy? Of course you could just bag up the candy, stick it in the freezer and use it again next Easter. The kids (or husbands) will never know, right? Well, I’ve got a better idea – bake with the candy, like I did with the recipe below. 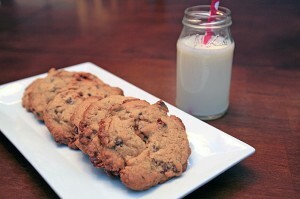 To make these Monster Cookies, I took our classic Chocolate Chip Cookie recipe and gave it a twist by removing the chocolate chips and using leftover Snickers bars. The caramel and chocolate will get melty and gooey and the peanuts add just a little crunch. We love how these turned out and we know you’ll be a fan too! Whisk the flour, baking soda and salt together in a medium prep bowl; set aside. With a hand mixer, blend the butter and sugars until thoroughly blended and creamy. Beat in the egg, egg yolk and vanilla until combined and fluffy. Add the dry ingredients a third at a time on low speed just until combined. Stir in the chocolate chips. Using a medium sized cookie scoop, form dough into balls, rolling them with your palms. Chill for 30 minutes. Preheat the oven to 325 degrees and line 2 large baking sheets with parchment paper. Place the formed dough balls on the prepared baking sheets, spacing them 2 1/2 inches apart. Bake until the cookies are light golden brown, 15 to 18 minutes. Cool the cookies on the baking sheet. Transfer the cooled cookies to a cooling rack.